Hahei Beach Road Bach is just a short drive from Hotwater Beach and Cooks Beach. This bach is centrally located to many of the tourist destinations of the Coromandel Peninsula. 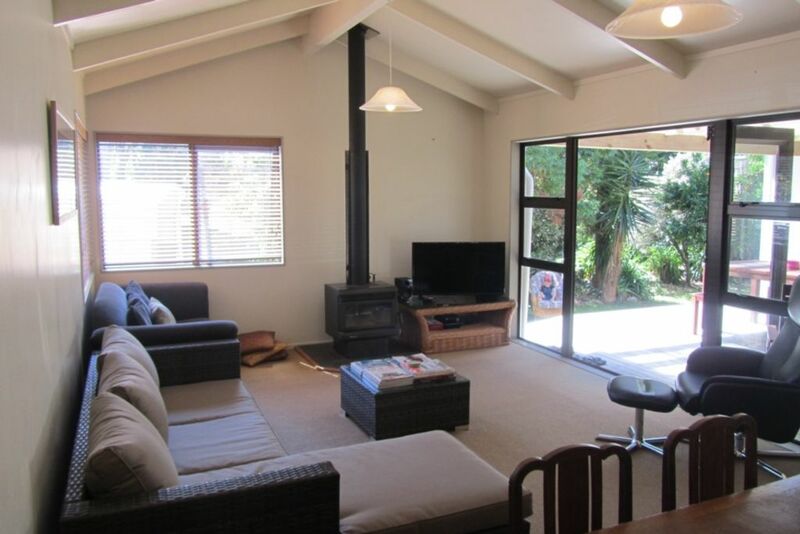 Hahei Beach Road Bach is an airy and sun-filled 3 bedroom house with open-plan living. Both the master bedroom and double bedroom have the benefit of an ensuite each. The double bedroom also has a separate nursery attached which has a portacot, highchair(attaches to a bench) and foam mattress suitable for children supplied. The bunk room has 2 bunk beds and a pull out rollaway bed. There is a separate toilet in the laundry right next door to the bunk room for these guests to use. Hahei Beach Road Bach wraps around a central shaded deck which ensures great indoor outdoor flow. There is plenty of space for vehicles as a lockable garage and open carport is attached to the house and room in the driveway for more vehicles. The key feature of Hahei Beach Road Bach is its location with Hahei shops, restaurants and playground directly across the road makes this an awesome spot for families to walk everywhere. The beach is a flat 4 minute walk away and there is an extra outside shower to use on your return. The garden and deck offer privacy for a peaceful breakaway, or head out to the beach for sun and surf. Private large section with mature trees and sheltered sunny deck to relax on. Great location, tidy and comfortable! A great place to stay, really handy to the beach, dairy etc. Located 4min walk to the beach. Very well equipped. Comfortable seating, good outdoor spaces. We would happily book here again.